I decided to start experimenting with recipe testing based on my flourless peanut butter oatmeal cookies. I began by replacing the peanut butter with almond butter and sugar with honey. I also reduced the amount of sweetener since honey is naturally sweeter than sugar, therefore I didn’t need as much. The result? Perfectly soft and chewy cookies. No guilt attached. LOOK AT THEM. CHOMP. CHOMP. These cookies have it all: A little sweetness from the honey (or maple syrup) along with melty, warm dark chocolate chunks plus a little salt for that perfect contrast. It was love at first bite. Another great perk of this sweet is they are gluten free and paleo (I think). I’m not on the paleo train but I started discovering that many of my recipes could probably fall under that diet category. Oh, and I can’t forget to mention that you can tailor the cookies to your liking! If you prefer a crispier cookie, use brown sugar instead of honey. Instead of almond butter, you can use your favorite nut butter (like peanut butter or chocolate peanut butter). Feel free to fold in coconut, dried fruit, oats, or your favorite chocolate bar chopped up; the possibilities are endless! If you bake these, be sure to post a photo to my Facebook page, or tag me on Instagram. Enjoy! 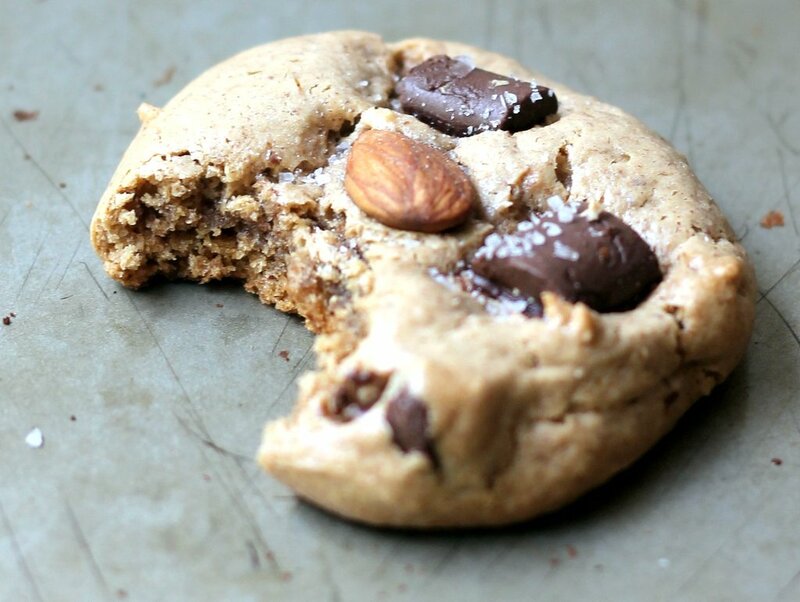 Soft and chewy almond butter cookies with the perfect sweet and salty notes. Flourless and gluten free, too! 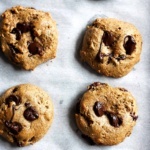 Drop tablespoon sized balls of dough onto a baking sheet lined with parachment paper, top each cookies with extra chocolate chunks and an almond if desired. Bake for 10-12 minutes or until cookies turn a slight golden brown underneath; they will be puffy! Cool on the baking sheet for 10 minutes then transfer to a wire rack to cool completely. Repeat with remaining dough. Makes 18 cookies. 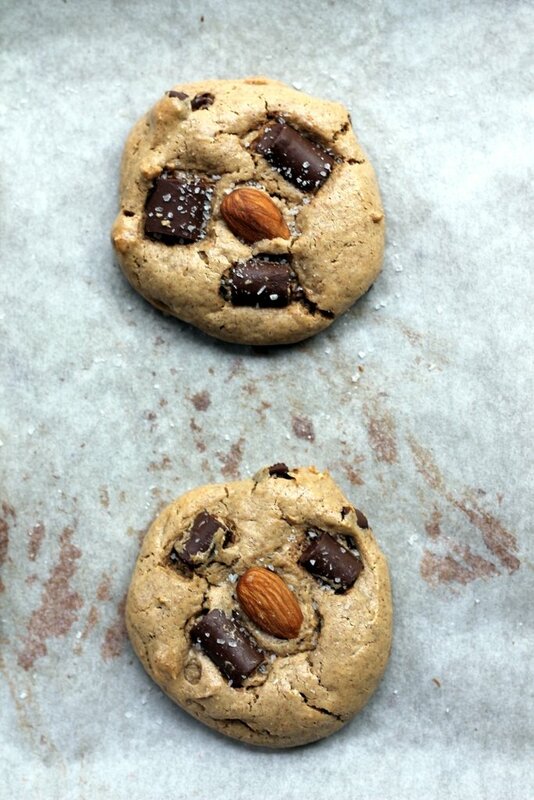 105 Responses to "Flourless Almond Butter Dark Chocolate Chunk Cookies with sea salt"
Oh yummy! These look so good! Definitely going to pin this recipe for when a sweet craving hits! These DO look fabulous! Lovely GF recipe! yum, these sound uh-mazing. & look even better. I’ve been eyeing these ever since I saw the preview on Insta last night!! I do not do a lot of baking, and have never made anything that didn’t have flour in it that was supposed to be cookies. I am amazed that they even look like cookies! They sound very good – well worth trying. These look so good! 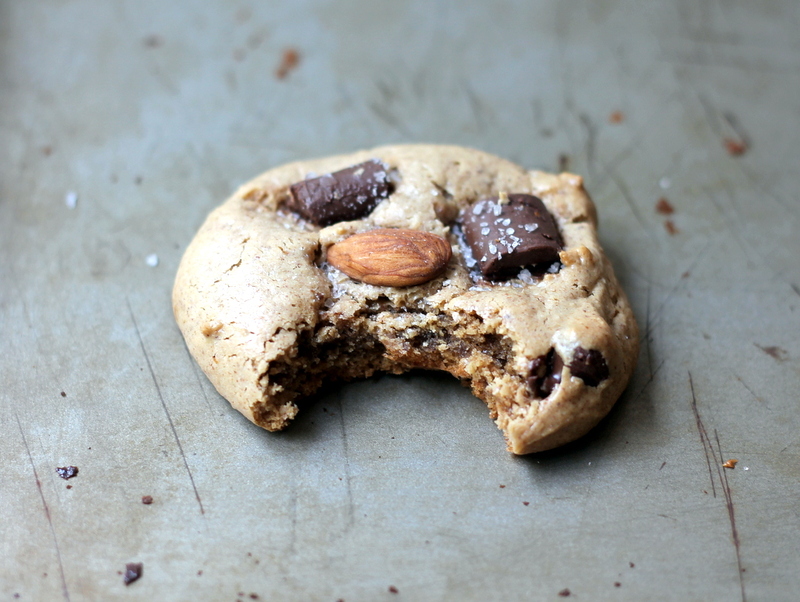 I just made chocolate chip cookies with almond flour–love the idea of using almond butter! I LOVE almond butter! It’s really one of my favorite things. I’m surprised these are so thick without any flour! Pinned it! These cookies look awesome!!! Whoops, I ate the whole chocolate bar…. That close up photo. Mmmm. This is the best gluten free chocolate recipe yet. I would use sugar free dark chocolate. Love the gluten-free recipe! Look forward to trying it! Love your recipes and enjoying perusing your blog! I love your voice in your writing. I love cookies like this, too. These look fabulous Monique! And loving that they are pretty guilt free so that I wouldn’t feel bad if I ate a dozen in one sitting. They taste good but the chocolate I put on top melted so doesn't look like yours! Hi Nina! So sorry to hear that. I would absolutely try them with peanut butter. It could have been the almond butter you were using. Sooo, i saw this recipe and went straight to Wholefoods for a jar of almond butter. Came home, scooped the butter into a cup, and it wasnt enough! so painful aha. I thought i’d compensate by adding 3 huge tablespoons of malt powder. It was the worst slash best move i could have made… the cookies were so SO flat, the taste was weird but i still cant stope eating them! Thank you for sharing, theres a pic of the finished cookie on my instagram… did i mention that they all congealed together? i made the far too big and ended up with just 6 cookies! Used caramel almond butter. Put in oven and the ran everywhere. So I guess next time I will use regular almond butter and see what that does. Dough was good though. OKAY! The verdict's in, they DEFINITELY taste better than they look. So I'm very happy about that. 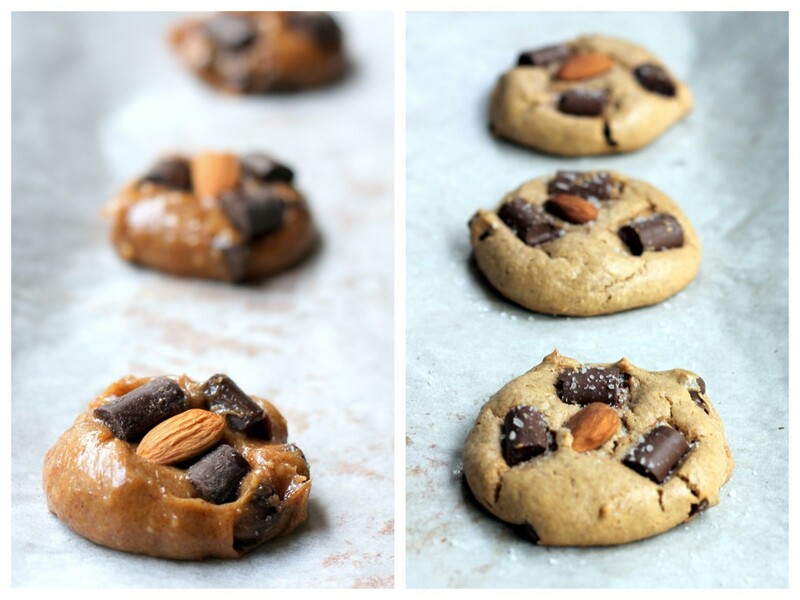 In fact they're the best almond based recipe I've tried…and I've tried a few. I don't know if my baking soda was bad or what, but these didn't RISE at all and I had to PRY them off the cookie sheet. But I'll try this recipe again, with a coconut oil prepared pan and a new box of baking soda. But the batter consistency of your recipe still concerns me. These turned out awesome! Whole fam finished them off in one evening =D My mom even wants me to right it down, so she can make them again. I didn’t have any consistency issues like others had thankfully. I didn’t have parchment paper and just buttered the baking sheet. I was so happy when they didn’t stick! Such an amazing recipe. I only had Justin’s Maple Almond Butter in my cupboard so I used that in addition to a little less than 1/3 of a cup of maple syrup. The cookies are delicious. I only hope I don’t eat them all before my kids wake up 🙂 Thanks! Yes I agree with the other two posts, I followed the indigence and the method and the oil from the almond butter separated from the dough. I believe your recipe does not have enough baking soda or a boding agent to soak up the oil. I don't know what you did… but when I followed the recipe it turned out really bad. Sorry, just thought I would let you know, is there something you had done different and forgot to add it to the recipe? Made these this morning exactly according to the directions. They were fast and easy–and delicious. My chocolate chunks melted, too, so next time I'll try poking them in immediately after I remove them from the oven. Also, recipe doesn't indicate, but the sea salt should be sprinkled on as soon as they come out of the oven. My sea salt granules were too big–next time I'll use smaller ones. These were so easy to make and turned out delicious. I almost ate the batter before I baked them. Instead of an almond I used a pecan half on each cookie. Definately making these again! 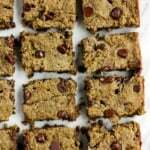 I made these with flax seed egg replacer and, for the vegans out there, they were fantastic! Can you freeze some after baking? I'm worried I'll eat them all and by the look of all the comments they're too good to give away! 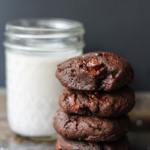 I was digging through my email for a completely unrelated recipe….stumbled upon this one (that I never read)….and immediately baked them. Mine turned out quite a bit flatter than this (maybe it was my almond butter? or maybe I over-beat the dough?) but the flavor is amazing. Love them and will definitely give them another whirl to see if I can keep them a bit more puffy. Woman, You are a GENIUS! This recipe ROCKS! Can't wait to tell hubby what the ingredients are. My cookies looked just like yours. I hand mixed until I thought it was binding. I did add a dousing of coconut sugar crystals and a lite dusting of date sugar. Both have a brown sugar flavor. But the texture was right even before my extra dry adds. I use non sweet dark chocolate baking bars, so I chopped 1/4 of your suggestion. Toasted/chopped some almonds, added that to the mix. I was nervous about the review/spreading so I put half the mix into a pie shell to bake as bars. 15 minutes on the bars 11 on the cookies. The other half formed as cookies. Remember to chill first if you recipe is loose/or spreading. This recipe is really a great idea. A great recipe and even better flavor. Woo hoo. YOU ROCK! I have made these several times and love them! Best grain free cookies I have made. I decided to make a batch yesterday and used cashew butter instead of almond butter and they were fantastic! My husband (who prefers his food to be full of gluten and sugar) even had two of them and agreed they were really good. I also had cookies that spread really thin with the chocolate on top totally melted. I'm thinking a cooler over with more of a bonding agent… maybe some almond flour? Yum!!! Halved the recipe but kept whole egg and they came out amazingly good. nevermind my last comment, i saw Monique suggest peanut butter, so I’m going to give them a try with it! I put in raisons instead of chocolate and a big handful of shredded coconut and they were delicious!! I had the same spreading/flat problems that some others had…maybe I’ll add some almond meal next time. Love your blog! almond meal would be a great addition or some GF oats. Sometimes it just depends on the almond butter you are using! I just made this recipe last night and oh my goodness was it amazing! 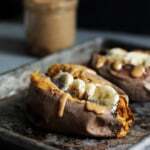 I swapped almond butter for crunchy peanut butter and it was oh so delicious! So making these in the new future! These are insanely good! I made them with no additions (no chocolate chips or fruit or nuts) and my son, who is on a very strict diet (SCD) LOVES them. Great texture, great flavor. This one is going in heavy rotation. Edited to add: I added 1/4 cup almond flour as one of the commenters suggested, because my almond butter was very wet. Worked great! can you use sweetener instead of honey? I’m a low carber. I have sugar free choc chips. Used peanut butter turned out very good! 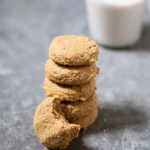 I love almond butter and almond butter cookies are one of my favorites! Mine were very tasty, but very crumbly. Any tips for that? Monique! What a wonderful recipe! I omitted the honey altogether to make them more healthier. That made them a little dry and crumbly, but it wasn’t a bother. I am so happy to now have a cookie recipe without flour and without sweetener. My whole family was very impressed! Thanks a lot! Just made these, used 1/2 of all ingredients with 1 egg (using my homemade almond butter so I didnt want to use it all up). Extremely fluffy and light. Will definitely make again 🙂 Thanks for recipe! What is the substitute for the honey? I need to decrease the sugar ……. These are amazing! I have tried a few GF recipes for chocolate chip cookies and this was by far the best results I have ever had. My 5 year old loved them. Fast and easy to make. If I am going to snap and eat three chocolate chip cookies on a Sunday afternoon, I’d much rather indulge in these then butter, flour, sugar filled traditional cookies. These are quick and easy to throw together and very good! I used Enjoy Life chocolate chips and they came out soft and chewy. Yum!! Now, time to work out…. Just made and are WONDERFUL!!! This will be my summer go to cookie recipe. Thank you! Love this cookie! I added 1/4 cup of cocoa powder and let the batter sit for a few minutes, this thickened it alittle to make a better consistency. They came out great! These are excellent. Thank you for posting it. It’s a great, flexible recipe. I’ve made them many times. Sometimes I’ve added shredded coconut, pecans, dried cranberries, and a sometimes about a 1/4 cup of oats, and I’ve cut back on the honey/maple syrup and added a bit of moisture (milk or water). I’ve reduced cut the recipe in half and used a whole egg. They are always great. My non-GF husband and daughter love them too. Glad you’ve found some subs that work for you! Love these. I added one tbsp of brown rice flour to this recipe just in case.. as well as walnuts and oats. 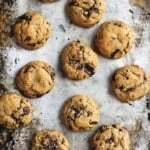 My new go to cookie recipe!!! Thank you so much! Great! Glad you love these! These were amazing cookies! I have made several recipes with almond butter which I grind at the store, so nothing is added. I loaded them with walnuts and cranberries along with a few chocolate bits. Very good. 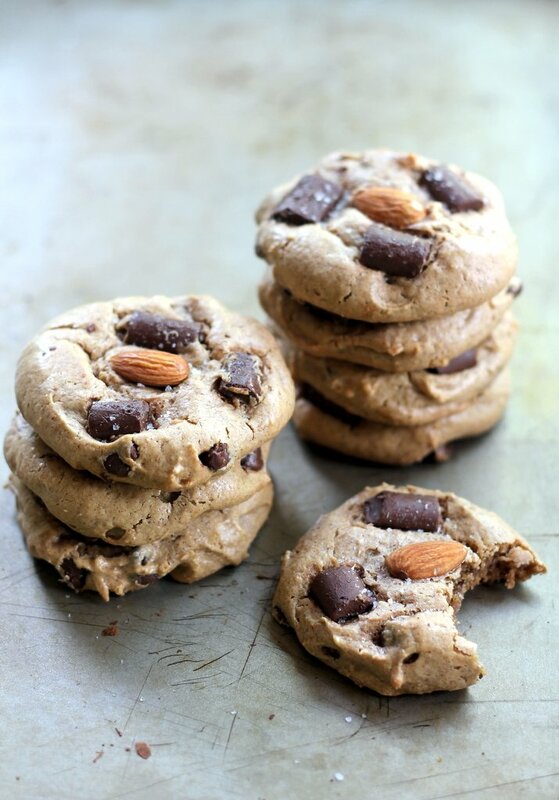 These are perfect for using that all-natural almond butter! Love your add-in ideas, too. 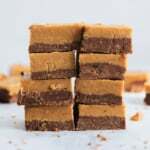 I don’t usually comment on blogs, but just wanted to thank you for this recipe. I made it a few minutes with cashew butter instead of almond butter, used maple syrup, and added M&M’s. The smell coming out of the oven was divine! I had to have two right away, and am very tempted to grab another – they are delicious! My cashew butter was refrigerated and fairly firm, I’m wondering if some who had issues with runniness had a more oily almond butter that wasn’t refrigerated? So glad you loved these, Susanna! 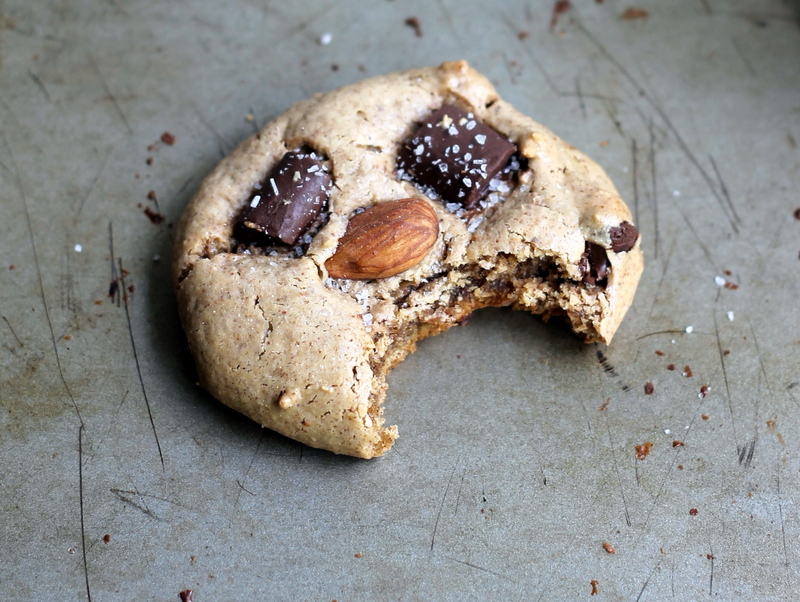 The type of almond butter used could definitely affect the baking here. Also, I’ll have to add M&M’s to mine next time!